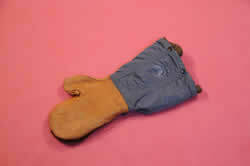 One U.S. Air Force mitt. Leather hands with fur backing. Nylon arms with removable fleece lining .Three canvas tightening straps. On outside Circle with pair of wings and a star. Underneath this the letters "U.S.AIR FORCE" Inside on the fleece lining the same circle and letters and a black label which reads "INSERT-GLOVE, AIR CREW, MITTEN STYLE TYPE N -4B SPECIFICATION MIL - G - 6269A SIZE MEDIUM ORDER NO. AF (602) - 5260 STOCK NO. 8310-597300-223 NORTHWEST GLOVE COMPANY U.S. PROPERTY"